As a Ph.D. candidate in Nursing, Allison Lewinski took part in a week-long course in London to inform her work on social interaction among individuals with type-2 diabetes who are interacting in a computer-mediated environment. She was among 18 Duke University students who received Graduate Student Training Enhancement Grants (GSTEG) in 2017-18 from the Office of the Vice Provost for Interdisciplinary Studies for training beyond their core disciplines. Her faculty mentor was Allison Vorderstrasse. I attended the course, “Behaviour Change Principles and Practice,” at the University College London Centre for Behaviour Change with funds I received from GSTEG. This five-day intensive course focused on the principles of behavior change and how these principles can be applied in behavioral research interventions from the individual level through the community/health systems level. During this course, I obtained knowledge on the various aspects one must consider when developing and implementing an intervention aimed at changing behaviors. The first day focused on an overview of behaviors and how behavior change is an iterative process that occurs at different levels. Lectures on the second day focused on changing behavior by changing one’s capability, opportunity, and motivation. On the third day we focused on how to identify a behavior to target, how to assess behavior change, how to describe intervention content, and what behavior change techniques to use in order to change the targeted behavior. The fourth day focused on how to deliver interventions and address challenges to implementing interventions in various systems. The final day focused on developing an evaluation strategy for behavioral interventions. In my view, one of the most valuable parts of the course was the small group sessions in the afternoons. The small groups consisted of a faculty member who was an expert in behavioral change interventions and three other students. In these small groups we reviewed the course content, discussed challenges inherent in designing and implementing interventions, and received guidance on how we should apply the course content to our own work. This truly was an interdisciplinary experience as the faculty leaders and other students had different research and content backgrounds and came from various countries around the world. This week-long intensive course expanded my knowledge about all the components to consider when designing behavior change interventions! I obtained insight into what behaviors to select and target in an intervention and what factors to consider when developing an intervention. Additionally, I interacted with individuals from a variety of backgrounds who were also interested in developing interventions focused on changing behaviors. 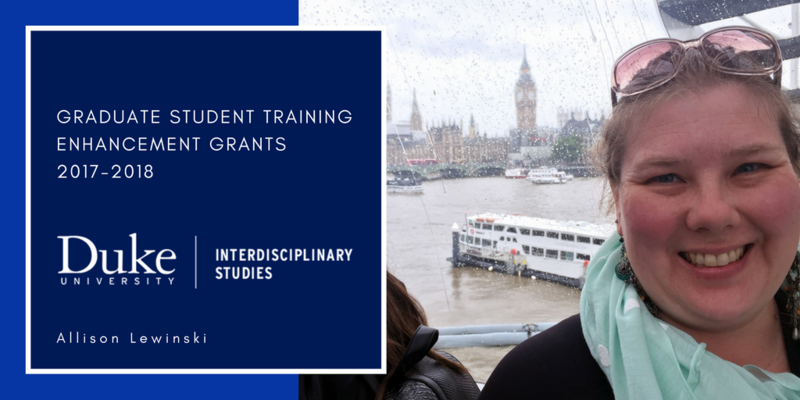 The funds from GSTEG enabled me to take an international course, which expanded my research network; I was able to interact with other researchers who provided me with new perspectives on my own research. Overall, this course better prepared me for the postdoctoral position I recently started in health services research at the Durham Center for Health Services Research in Primary Care at the Durham Veterans Affairs Medical Center. This internal funding mechanism from the Office of the Vice Provost for Interdisciplinary Studies encourages doctoral and master’s students to step away from their core research and training to acquire skills, knowledge, or co-curricular experiences that will give them new perspectives on their research agendas. Graduate Student Training Enhancement Grants are intended to deepen preparation for academic positions and other career trajectories. See who else received these grants for 2017-18. Proposals for 2018-19 were due on February 16; those grantees will be announced shortly. Review the 2016-17 GSTEG summary report.